"We can't add days onto their lives....but we CAN add life to their final days"
We believe that the process of dying is a stage of life that should be validated. Our volunteers have been specially trained in the skill of active listening and will emotionally be where the resident is, sharing their joys, fears, and reminiscences. The staff and volunteers will ensure a safe, loving environment for the residents and their family and friends. House of Grace is nondenominational. Admission is based on need, regardless of gender, race, religion, or age. Our residents may not have a home with the space or set up for the medical care they need. A family member may need to continue employment outside the home and is not able to provide round the clock supervision and care. Our service area includes Warren, Washington, Essex, Hamilton and Saratoga counties and the entire "North Country" of upstate New York/Adirondack region. We offer a true home. A place to live and accept life's end in peace and comfort. While we are not a hospice facility, all residents will be pre-enrolled in the High Peaks Hospice Program and receive full hospice services. Our volunteers provide compassionate care, social stimulation and active listening. There is a full kitchen where residents and/or their loved ones can prepare meals; or our volunteers & staff can prepare them. Meals-on-Wheels may also be utilitzed to provide afternoon and evening meals on request. We ask that residents and their family provide their resident's groceries if financially able. Each of the two resident's spacious, private bedrooms have a sofa-bed that families can use, if needed, in spending the night with their loved one. We have a completely ADA compliant bathroom with walk in shower. Also, a quiet room is located downstairs for the family. The House of Grace of the Adirondacks, Inc. receives no direct medical care funding. As a 501 C 3, nonprofit organization, we are totally dependent on the generosity of our local communities for financial and material support. 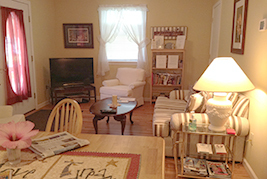 We do request a room rental donation to assist us in covering some of our day to day resident care services. With that support House of Grace will continue its much needed Mission. Please help us GO GREEN by providing us with your email address to be added to our bimonthly E-newsletter and event announcements! Please note: Some articles and newsletters linked on our website are archived documents and therefore may contain out of date information. Our "Angel List" Click here to see what ITEMS we can use for the House and our Residents. Admission Criteria for House of Grace of The Adirondacks, Inc.
PRI and Screen completed within a month. The PRI and Screen is used to determine the level of care and appropriateness of placement should the individual need to be transferred to another facility. With the above criteria met, resident selection is based upon the person or situation that presents the most significant or immediate need. *A room rental donation policy was implemented in 2014 to assist us with financial support relating to the day-to-day resident care services, however no one is turned away due an inability to pay for their stay. "We allow our families & friends to enjoy the role of loved one, rather than the role of (medical) caregiver"
Website Design, Development, and Search Engine Marketing by Mannix Marketing Inc.